BUT WE ARE STILL HERE AND WORKING BEHIND THE SCENES TO HELP "SAVE OUR CROWN MEADOWS"! The meadows are certainly very, very wet right now and have never dried out since the big flooding almost a year ago. They are almost like marshland. I guess that's why they're termed a floodplain! As a result there are many wetland birds taking advantage of this natural habitat. Swans and their young have also been coming into the meadows, to have a rest from the frequently much swollen and raging River Stour over the last few weeks! 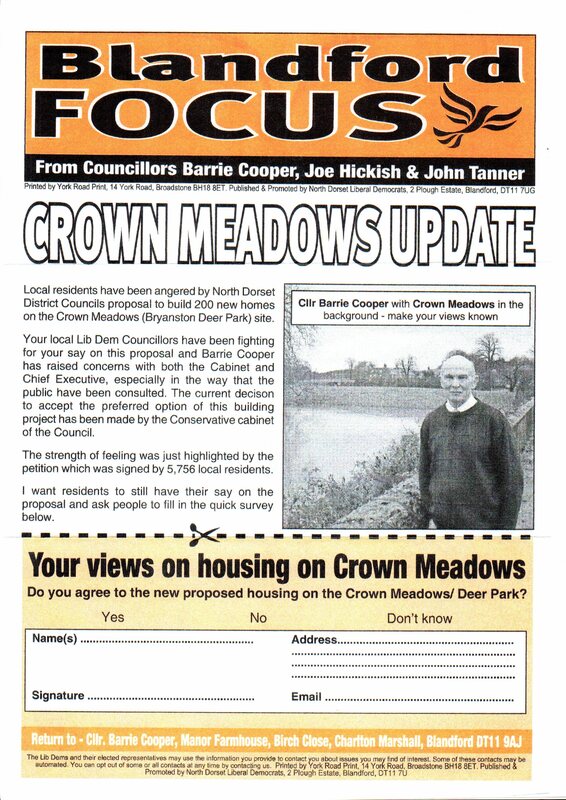 Councillor Barrie Cooper asks residents to have their say on the proposed development of the Crown Meadows by filling in the quick survey at the bottom of their flyer. Please see below. Please do let Councillor Barrie Cooper know your views by filling in his survey form. This should be posted to Cllr Barrie Cooper, Manor Farmhouse, Birch Close, Charlton Marshall, Blandford Forum, DT11 9AJ.